Hei, tänään jaksoin jo vähän väritellä, käsittelyyn pääsivät ensiksi Bugaboon pupujussit. Kuva oli pitkänmallinen, joten tästä sai oivasti kabinet- kokoisen kortin. Hi, finally some coloring today. 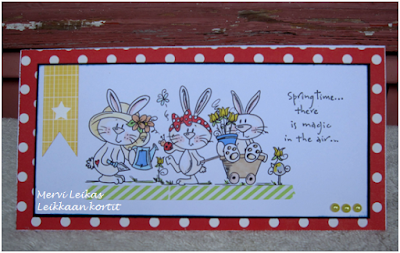 I started with (my new) Bugaboo's Spring Bunnies. Image is coloured with Promarkers and text stamp is Penny Black's. Brilliant card, love the images . (Sorry, correcting typo!) Very sweet Spring card, Mervi. Sometimes a different size is fun to work with. Love the washi tape "ground" for your Bugaboo Bunnies. Thanks so playing along with Catch the Bug this week. It's still a fairly simple design and I think you were right to add the tape and strips, they go well with their springlike scene. Cute! 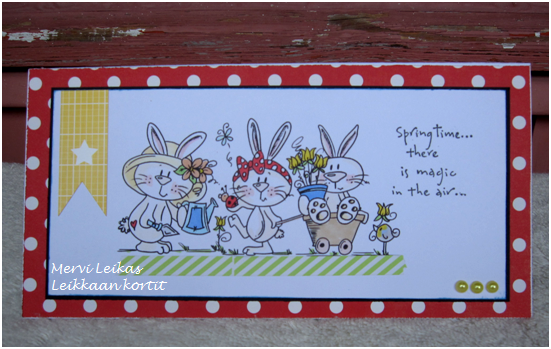 The Spring Bunnies are darling and I love the size of your card. So glad you shared your creation at Catch The Bug.